Summary: In the next thrilling novel in the #1 New York Times bestselling Mitch Rapp series, the anti-terrorism operative heads to Pakistan to confront a mortal threat he may not be prepared for. In fact, this time he might have met his match. Mitch Rapp, CIA agent, is a character developed by Vince Flynn in a series that contained 13 installments. After Flynn’s death in 2013, author Kyle Mills completed the 14th installment of the series based on a few pages written by Flynn. In ORDER TO KILL, author Kyle Mills carries on the Mitch Rapp series on his own with this 15th installment. Russian president, Maxim Krupin, knows his country is in an economic downward spiral as the price of oil declines. He sets in motion a plan to sabotage Saudi Arabian oil fields in order to reduce the supply of oil, raise oil prices and make the world more dependent on Russian crude. Krupin enlists Grisha Azarov, a younger, faster and stronger version of CIA man Mitch Rapp to carry out this plan. What results is an exciting matchup of adversaries in a dramatic and tense action thriller. Author Kyle Mills puts the novel in a modern setting by introducing a Putin-like character, Russian mafia-like oligarchies, Pakistani nuclear weapons, Iraq and ISIS. The stage for the drama is set when a coup attempt in Pakistan puts the country’s nuclear arsenal at risk to end up in enemy hands. The CIA assigns Rupp the task of preventing that from happening. Rupp infiltrates an ISIS cell only to find that the Russians are working with ISIS to use a stolen Pakistani nuclear bomb to destroy the oil fields. This leads to the inevitable showdown with Azarov. Other issues that keep the novel moving include Rupp and Azarov love interests, the search for a lost nuclear weapon, Rupp’s effort to escape from ISIS controlled Iraq, Rupp’s interaction with CIA director Irene Kennedy and a wild confrontation between Rupp’s team and Azarov’s terrorists. ORDER TO KILL encompasses all the requirements of an action thriller with its non-stop action and suspense. Mills utilizes a nice twist at the end to create an unusual ending for a thriller. 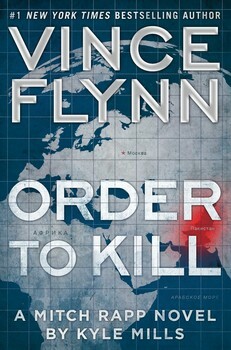 I have not read any prior Mitch Rapp novels but if they’re anything like ORDER TO KILL, they would make great reading. This sounds like it could have been snatched from today's headlines! I read all of Flynn's Mitch Rapp books. But I haven't read Kyle Mills version. No real reason. It sounds like Mills is doing okay.